From The Baker Street Journal, Vol. 67, No. 4 (Winter 2017), pp. 23 – 28. Two artists illustrated the original publications of “Shoscombe Old Place”: Frederic Dorr Steele for Liberty Magazine in the United States in March 1927 (Figs. 1 and 3), and Frank Wiles in the Strand Magazine one month later in London (Figs. 5–7). Both drove home the idea that the story possessed virtually all the elements of a Gothic tale. Lest we miss the point, readers are told in no uncertain terms that “Shoscombe Old Place” is Gothic. In both America and England, illustrators, designers, and publishers all combined to reinforce the message. If ever there were a case of the illustrators asking us not only to see, but to observe, this would be it. Fig. 1. Frederic Dorr Steele. Title illustration. Fig. 2. Frederic Dorr Steele. Detail of title. Where did these ideas come from? In 1757, an eighteen-year-old from Dublin published A Philosophical Enquiry into the Origin of Our Ideas of the Sublime and the Beautiful, a short treatise on aesthetics that would fuel the Romantic movement in the nineteenth century in art, music, and literature. Edmund Burke did not consider his essay special when he first wrote it, owing to the fact that the terms “sublime” and “beautiful” were in current usage and he was chiefly defining their meaning. Nor did his readers initially regard his analysis as remarkable, for they saw the subject from the same point of view as the author. Yet, over time, this work took on greater and greater importance for its precision and clarity and, especially, for the many ideas the author presented that future artists, musicians, and authors would explore. In the realm of the Sublime, Burke included Terror, Obscurity, Passion, Power, Vastness, Magnitude, Sound and Lightness, Suddenness, the Cries of Animals, Feeling, and Pain. In the realm of the Beautiful, he placed Proportion, Perfection, Smoothness, Gradual Variation, Delicacy, Beauty in Colour, Grace, Elegance and Speciousness, and the Beautiful in Feeling (to mention a few). By comparing the Sublime and the Beautiful, he arrived at the essence of his argument: that by producing pain and fear, one can produce delight, even wonder. More than anything, Burke is remembered for, in Samuel Johnson’s phrase, his ability to “shew how terror is impressed on the human heart.”3 This quality—how to create art out of terror—would be the most abiding offering of young Edmund Burke and the Romantics who followed him. Burke’s thoughts on aesthetics would ripple outward and down through time, still having an effect as late as 1927 with Conan Doyle’s story of a lonely mansion in the countryside and a missing woman. By then, folks in both England and America were finished with the devastation of World War I. They were riding in automobiles, talking on telephones, flying in airplanes, even extending the vote to women. Yet a reaction to horror still resonated. Turning to Steele’s illustration for Liberty Magazine, we see a dramatic scene of two men discovering skeletal remains in the crypt of Shoscombe Old Place (Fig. 2). It is the horrific nature of the scene and not the characters themselves—as they are, in fact, only minor characters—that has captured the imagination of the artist. In a tenebrous space, at the bottom of a steep staircase, the groundskeeper and his assistant lean over, studying the human skull lying amidst the debris on the cellar floor. The terror—for terror is the dominating emotion of Gothic tales—is communicated through the selection of the subject matter, the scene, and the method of depiction. The artist has used his signature strong, abstract black lines to great effect here as they depict the darkness of the space and convey a sense of fear. In Liberty Magazine, the graphic designer and publisher were working closely with the artist to produce the initial impact of the design (Fig. 1). The entire front page of the story is a piece, an integrated design—from the multiple titles, to the image, to the text—all woven together. Titles are superimposed upon the picture of the men in the crypt, and the text curves around the base of the image. Furthermore, at the top of the page, the titles begin with the words, “A Sherlock Holmes Story by Sir Arthur Conan Doyle,” then, “The Adventure of Shoscombe Old Place,” then, “The Famous Detective Solves the Mystery of a Haunted Crypt and a Missing Woman,” all in fonts of descending sizes. The use of the words “Mystery,” “Haunted Crypt,” and “Missing Woman” signals that we are in for something of a thriller with an overriding emotion of terror. Fig. 3. Frederic Dorr Steele, Shoveling the skull into the furnace. Fig. 4. Frederic Dorr Steele, Skull in the cellar of the crypt (detail). Steele painted seven images for this story. The greatest impact is reserved for the initial image, the one that dominates the title page (Fig. 1). Most, but not all, are influenced by Gothic imagery. For example, there is one especially frightening painting of Norlett (the husband of Lady Beatrice’s maid) shoveling a human skull into the furnace in the cellar of the crypt (Fig. 3). The story is given its final punctuation with a small image that is a detail of the opening title page—a picture of the human skull on the floor of the crypt (Fig. 4). In England, Frank Wiles, a competent artist, if less inspired than Steele, illustrated “Shoscombe Old Place” with five images, three of them possessing strong Gothic features. The second image of the story (Fig. 5) shows a strange man, presumably Norlett (who was working with Sir Robert, but was not well known on the estate), running in fear from the haunted crypt of the old ruined chapel in the park. Meanwhile Mason, the trainer, and Stephens, the butler, look on in amazement. Terror is clearly indicated by the fear on the man’s face and the fact that he is in full flight. Meanwhile, the Gothic ruin of the church rises in the background. In Wiles’ fourth image, showing Sherlock Holmes descending into the crypt holding an electric torch with a thin beam of light, we see the dark spaces of the interior and the heavy stone architecture (Fig. 6). Anyone fearful of cold, dark, stone buildings would react to this picture of the men descending into an unknown and unknowable black hole within. In the last image, Wiles shows us the most horrible aspect of the story, the mummified corpse inside a coffin deep inside the haunted crypt of the old church (Fig. 7). Here Holmes confronts the villain of the tale in an attempt to unravel the mystery of the missing woman. Thus, with all three images, Wiles has built a crescendo of terror based upon elements of the Gothic: fear and terror in the characters represented, a haunted building, dark spaces, confinement, actual Gothic ruins, a mummy, a coffin, and a confrontation with a villain. Both artists also created a few images for the story that did not depend upon Gothic imagery and terror for their impact. 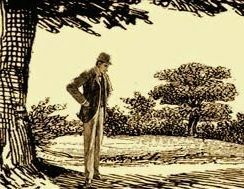 Perhaps they were aware that “Shoscombe Old Place,” for all its Gothic features, was leavened by the fact that it is fundamentally a detective story and relied upon deductive reasoning, not simply emotional reactions for its basic structure. By 1927, the detective story was a well-established genre with accepted rules that included a main character who would investigate a crime, several plot elements of a crime—usually murder—and the use of clues and logical reasoning to unravel the puzzle. Thus would the villain be exposed. “Shoscombe Old Place” thus is not a racehorse story at all, but rather a detective story concerning an aristocratic family in a country house, a tale with the strongest Gothic features—features that the illustrators, designers, and publishers were well aware of from the initial publications in America and England. True, Liberty Magazine does have one of the most sensitive illustrations of a racehorse, Shoscombe Prince, and its owner, Lady Beatrice, painted by Steele. Yet Steele, through the majority of his illustrations from the monumental first image of the two retainers discovering a skeleton in the cellar of the crypt to the other frightening pictures he created, has left no doubt that Gothic imagery dominated his imagination for this story. Similarly, working for the publisher at the Strand Magazine in England, Frank Wiles took the approach of producing several Gothic-influenced illustrations to accompany the story. 1. As my colleague, Roger Donway, has very convincingly maintained through an examination of the text of “Shoscombe Old Place,” Conan Doyle’s story can certainly be regarded as possessing many characteristics of a Gothic tale. See his “Sherlockian Gothic in Conan Doyle’s Own Last Bow” in this issue. 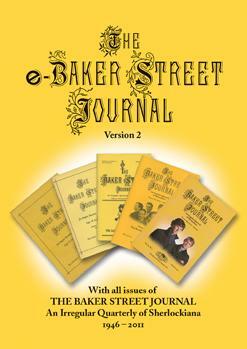 See also Philip A. Shreffler, “Watson’s Weird Tales: Horror in the Sherlockian Canon,” Baker Street Journal, Vol. 56, No. 2 (Summer 2006), pp. 6–16. Not only is this an overview of Gothic features, but the author makes an interesting distinction between “terror” as a transitory emotion and “horror” as a more lasting and deep-seated one, both components of the Gothic. Some argue that horror is the more important; I would maintain that both are equally important. 2. See Dan Andriacco, “Gothic Holmes,” Baker Street Journal, Vol. 67, No. 1 (Spring 2017), pp. 11–17. This is an excellent survey of Gothic elements in the Canon. Andriacco defines the Gothic in literature (not art) as 1) mood, frequently manifested as stormy weather, 2) creepy houses, abbeys, crypts, etc., 3) character: beautiful woman in distress, handsome suitor, and villainous villain, 4) the supernatural as, for example, a huge, other-worldly hound that glows in the dark, 5) terror and possibly madness. 3. Edmund Burke, A Philosophical Enquiry into The Origins of The Sublime and The Beautiful, London: Penguin Books, 1998, loc. 180.